The Giant Celestron 15x70 Skymaster Binoculars provide you with the best technology, amazing performance, and best of all, at a price you will not believe. Specially envisioned for astronomy, the appropriately named Skymaster binoculars will give you a crystal clear view of distant stars and star clusters, the amazing Jupiter with its moons and the great rings of Saturn, providing an intimate insight into the depths of space. However, these extremely versatile binoculars can also be used for various terrestrial uses like bird watching and observing wild life, or any function which needs powerful long distance capability. 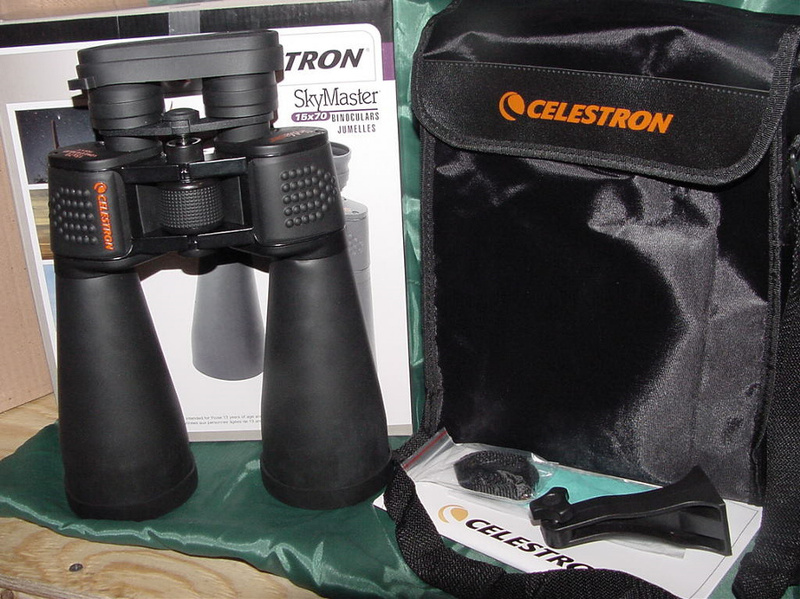 Check the price of Celestron SkyMaster Giant 15x70 Binoculars with Tripod Adapter here. The Skymaster binoculars are equipped with high quality BAK-4 prisms with multiple coatings which provide enhanced contrast and enable the highest level of light to reach your eyes. Even in dark sky environment, nothing is too faint or out of reach of a powerful Celestron Skymaster binoculars which shows you distant galaxies and nebulae. Besides being completely water resistant, the Celestron Skymaster 15x70 comes with an adaptor enabling the use of a standardized tripod, as well as a case for safe storage and travel. Its other features are a protective rubber finish providing a steady grip, a prominent focus dial for easy handling and long eye relief suited for people wearing glasses. Also, you can be totally carefree because of the Celestron No Fault Warranty which offers the best protection and support on the market. Below the rubber finish, the binoculars are made from a polycarbonate, which is both durable and lightweight but at the same time affordable. They are very sturdy and resistant to most bashes and bangs coming from daily use. The rubber finish extends over the most of the binoculars, with the exception of bridges and few minor details. The rubber itself is hard and smooth, which does provide lesser grip then on some other models. It is always important to have a firm grip and good balance when holding binoculars, but this is crucial on a strong and heavy binocular like this one. For this reason, Celestron has added several indents on the underside of the binoculars intended to provide you with a firmer grip on the body, while at the same time positioning your hands within easy reach of the focus dial. A tripod can be the one of the most important tools, providing you with a stable platform for a clear and shaking free image. For this reason, the Celestron Skymaster is designed to be very easily attached to your tripod, by simply unscrewing a small circular cap featuring the Celestron logo located on the front bridge, and then screwing in a tripod adapter featuring the standard ¼ inch thread. 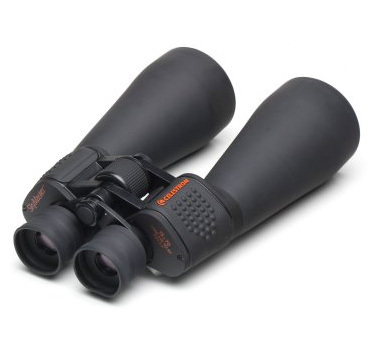 The binoculars are provided with an excellent Celestron adapter, produced from a hard plastic and featuring metal threads preventing cross threading. My experience is that the heaviness and leverage of this large binocular causes some twisting and movement when aiming the binocular attached to the tripod but that movement would be canceled as soon as you placed your eyes to the eyecups. The eyecups are made of soft rubber and feature an external diameter of 50mm, which is also larger than eyecups of most binoculars. In my experience, the eyecups were quite functional but I had to press them firmly to my face so my eyes would get close enough to see the full view, without seeing the rubber edges, and this became a bit discomforting when I had to use the binoculars for a longer time. 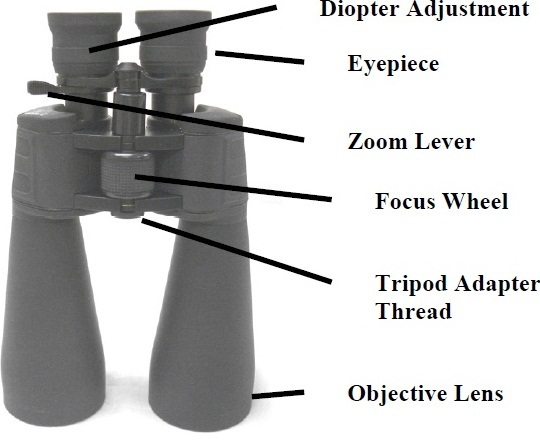 The distance between ocular lenses of the binoculars can be adjusted to correspond to the distance between your eyes simply by adjusting the central hinge. This measure, called the inter pupillary distance, can be adjusted on a range from 5.6 cm to a very wide 7.2 cm. The lowest setting is nicely close and common for most full sized binoculars on the market, so it should work even for people with fairly close set eyes. The focus dial is easily reachable and large, which in combination with the high texture rubber finish makes turning it with extreme precision very simple and nice, even if you happen to wear gloves. This is very important for people using the binoculars in winter conditions. Compared to standard full sized binoculars, the Skymaster is quite a bit heavier. That is to be expected, given the binoculars exceptional size. Overall, the Skymaster 15/70 Binocular will give you a very serious and large aperture for light gathering, providing clear images in dark conditions, at a very reasonable price and with a surprisingly lightweight body. Adaptable binoculars intended for astronomy but which can be used for most terrestrial applications. For the such a low price you get a good quality binoculars that you can use for wild life and night sky watching, its high quality optics are excellent for low light conditions. A great piece for watching our solar system or distant wild life. There is no such low cost astronomy binoculars out there!